hi everyone, God it's cold today! I don't know about you but I am a little sick of the 's' word now, we don't have much left and hopefully it won't return. Yes it was pretty and lovely but it was also massively inconvenient for many, lethal for some and I personally was a stir crazy mummy by the end of last week as getting out with the Boo was very tricky! I know from reading some of your blogs the snow was inspirational and also had some of you literally trapped in your homes! Anyhow, something that arrived yesterday to brighten up the grey skies were these beauties. Aren't they lovely? They are made by a lovely woman called Victoria who lives in Scotland and sells here wares on etsy under the name of re:made. here is a link to her shop. Apols for blurred photo here, trying to get snaps done with Jake grizzling in background (teething!) is not easy! 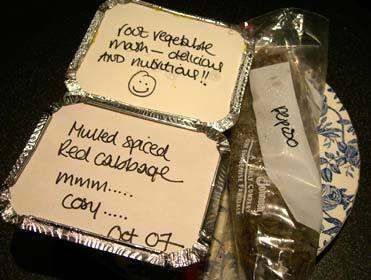 I also like the way she packages her stuff up - simple but effective! What's really perfect about these is that when pram pushing but needing to answer my iphone with it's touch screen, fingered gloves don't work - the phone needs your finger to actually touch the screen, or so it seems, and by the time you get the phone out of pocket/ bag and hoick a glove off the caller has rung off - highly irritating! So these are just the thing. And soooo stylish too! I bet I never see another person wearing them which also satisfies me greatly! I did try to take a photo of me modeling a warmer but as you can imagine it was tricky and by the time Dom was back from work the light wasn't right at all. So get yourself along to remade's shop on etsy and have a look, and maybe a wee purchase! Well I wouldn't blame you for thinking that this blogging was all a flash in the pan and I'd be off again for 5 months! So you wanted to see the boy and here he is, a recent picture taken only this weekend just gone. I think I was pausing from drinking my butterscotch steamer (yum!) when I saw the opportunity to take this little snap of my men. As my friend Helen at Busy Bee would say, GORGEOUS. So what's new for 2010? Well back on with the cooking etc. I have been making some great things recently including some lovely gift food which alas I have not been sharing with you. Meany. But I will be back soon with a recipe. And some gift food as valentine's day is on the horizon...shhh... not a word. In the meantime, have a revisit of this classic which I am making for dinner tonight. except with rice not naan as our oven has broken down. did I not mention? three days before Christmas dear reader, three days before the most important meal of the year... Luckily the hob still functioned (all praise dual fuel) and my sister and her fiance who were our guests live but two streets away, so much tooing and froing in the snow with stuffed capon, roasted vegetables and sausage rolls ensued :-) In the SNOW. and ICE. All was well though. Now, where was I? Oh yes, using up plums and waiting for a baby to arrive. And boy has he arrived! I have been away from this blog for over 4 months now, all fanciful hopes of having more time to blog were swept away by the demands of Jake and the huge learning curve that becoming a mother is. I have to say I have been having the best time EVER and my little man is the most precious thing that ever was but I have been completely overtaken by the whole thing really and so, no blogging! However I have settled into it all now, the feeds are now every 4 hours not ever 2 and my nightimes wakening is generally down to just once so we are on a more even keel and have a little more energy. And I have missed it and according to my web stats people are still visiting and reading old posts so, onwards! It's snowy here, the photo is our wee back yard which is quite sheltered so not really representing how much snow has fallen round these parts. More soon and I promise a photo or two of the wee fella :-) what you want one now? oh ok, how about this one? ahh a bit sneaky as you can't really see him. Plus, this is way old, think he was about a month old at this point, maybe slightly less! So, more tomorrow, I promise! I love presents that just come out of the blue - so much better than those you know are to be given in a way - but on the other hand, I am not mad on surprises - so yes, contrary mary once again. Anyway! I got an email last week from Vanessa at Do You Mind If I Knit If you haven't checked this blog out, do, because it's always a good read, she makes very beautiful things which she shares with us readers and also has two adorable dogs, Ellie and Douglas who quite often get a look in. Anyway, the email. Goodness I am all over the place - combination of the hormones and the unexpected gift! Vanessa and her lovely Hugo had just stayed at our cottage for the second time and had by all accounts had a marvelous time - see her blog for some great posts about the delights of North Yorkshire! And see how I was rewarded for my trip? isn't this just lovely without even being opened? no, it is not a hat, it is a tea cosy! More specifically, a tea cosy for the teapot in the cottage! And all handmade by Vanessa herself. What could be nicerer? We had had some emails a while ago about me wanting to commissioned a tea cosy from her and I hadn't followed up on it, but clever girl that she is she remembered and knitted one which fits in with the whole Hideaway Cottage vibe perfectly! And look at the sweet little tag she made! So thank you SO much Vanessa. And in answer to your question, no I certainly do NOT mind if you knit!! I am just back from a spot of shopping in Whitby itself, such a nice place to Christmas shop! It's full of Victorian charm, the smell of the sea and the sound of gulls. The festive lights are not flashy city centre types, but charming more gentille ones and the shops are beautifully calm with staff who aren't too busy to issue good service and a smile and even stop for a chat. This picture is of one of my favourite shops in the town and a rare thing these days, an independent book shop, certainly in cities, and one that always takes a great deal of care over it's window displays, quite magical and of course designed to draw you right into the cosy store to look through it's selection of books, stationery and other gift items. I love the fact it still has the old decorators sign up from years ago. Unfortunately due to the limitations of blogging on my iPhone I can only show one photo per post or they go really small and look a bit rubbish, otherwise I would have shown you a close up of the display, a sort of icy, twiggy wonderland with some gorgeous books, cards and calendars that look so bewitching. Maybe you'll just have to come to Whitby yourself and have a peek :-) it's on Church Street on the old side of the town. If you have ever seen You've Got Mail with Meg Ryan and Tom Hanks, it's a little like The Shop Around The Corner. And what am I doing later? Why, going to a candlelight carol concert at little St Marys Church in Sandsend with mulled wine and mince pies! Lay a little egg for me! Just wanted to show you these beautiful eggs from our new friends Helen and John and their chickens. I don't know the chickens names but I do know the rooster is called Mr Darcy :-) I wonder... Lizzie, Jane, Lydia, Kitty and Mary perhaps?! I call this dish Sarah’s Sunny Squash because of the vibrant, sunny look it has and the fact that it always cheers me up. Something else which is sunny and always cheers me up is Sunila. But alas, Suni is in Sri Lanka for the foreseeable, which is quite a long way to go for dinner as you will appreciate. Which is a shame as the meals we have cooked for each other and shared are memorable. I remember a particularly lovely lunch she made me for my birthday whilst she was recovering from Chicken Pox – a velvety, rich soup made with this very squash and a wonderful salad with beetroot and pine nuts. And a tray full of candles to make like a birthday cake, along with a bar of green and blacks chocolate. I miss you Sunila, this is for you. gently fry the onion in the oil until its soft and translucent. Add the garlic and chilli flakes and stir in for a min or so. Then add the squash, slightly increase the heat and cook the squash until there are some slightly brownish bits and the outer squash has softened a bit. Then, add just enough stock to almost cover the squash and onion. Cook on a low heat until the stock has reduced and the squash is tender. Add the crème fraiche and stir in along with the coriander. Serve with the bread or rice. So simple but so nice. Do you remember those awful ads for Bud where frogs said "whasaaaaaaaaaaaaaaaaaaaaaap". Horrible. Stupid men everywhere said it, over, and over, again. 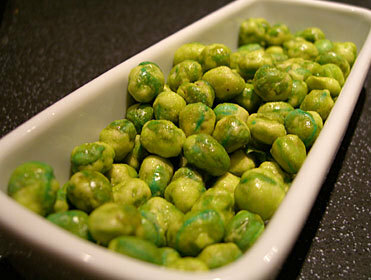 Anyway, no recipe, just an excuse to show you wasabi peas - have you had them? If not, get some, they are really, really delicious. Just be careful - too many in too short a space of time can give you what is now know in our house as 'wasabi nose' which is a bit like ice cream nose, except possibly more painful. Just one of the side effects of being greedy! Don't worry, I haven't gone mad and started buying actually ready meals. Even though I have been really busy recently and the last week in particular has been a total whirl, I haven't been that bad! This is one of the beauties of batch cooking and leftovers. Here we have Peposo, a Jamie Oliver recipe (love him, did I say already? Yes? Oh good) from this book which I batch cooked a while ago along with red cabbage and some root vegetable mash, both of which were salvaged from cooking too much. I thought this meal, grabbed from the freezer one morning last week and gratefully heated and eaten that evening, fitted in well with my current crusade to cook economically and not to waste food. The Peposo uses shin, a very cheap and tasty cut of meat and the rest, well, cheap as chips (as Jamie would say) and all vegetables bought from my local green grocer. And when you are sat slaving away at your desk, mobile in one hand, mouse in the other, the thought that this is waiting for you at home is just enough to get you through. I love Christmas. Scrap that. I ADORE Christmas. What's not to love? I am totally bound up in the rituals of it all and am currently tracking down the perfect advent calendar for me. 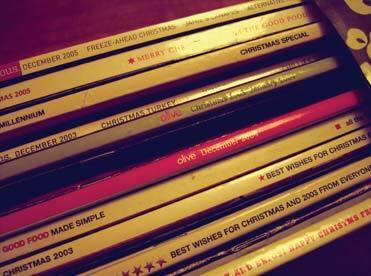 (For some lovely advent ideas have a look here). I don't like the chocolate filled ones, they are just not right, neither are the ones with branded characters, cartoons etc. I like a cardboard one with a beautiful festive scene and lovely little illustrations underneath every window, preferably of candy canes, puddings and angels. My all time favourite one was a Woodmansterne one with beautiful angels flying in a night sky. My personal all time low was one Dominic bought me in sheer desperation from a religious book shop, one with a nativity scene. The illustrations were really rubbish (the donkey looked demented) and behind each window was a pointer to a bit of the bible to read. I know Christmas is about Christ, the clue is in the title, but I am not especially religious and like to see it more as a yuletide celebration, a sort of shining beacon in the darkness and chill of deep winter. I realise the fact that my favourite one featured angels is a massive contradiction to what I have just said, but there you go. I am quite a contrary girl. And anges are pretty in a way that demented donkeys and sinister looking magi are not. Anyway! The best bit of Christmas is of course the food. Food to me sums it all up, its about bounty, sharing, pleasure, decadence and comfort. A Christmas without Christmassy food is not worth considering. I am not one of those people who wants to go abroad somewhere hot for Christmas and eat Thai curry instead of a plump bird with all the trimmings. That would not do at all. I might consider Christmas in a colder-than-ours European country, perhaps somewhere like Sweden or Switzerland, where I am betting they do Christmas really, really well on the culinary front. 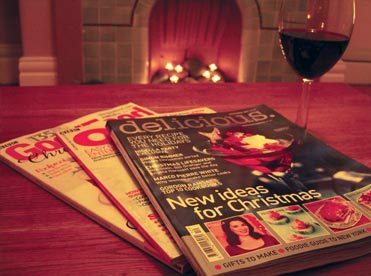 There is a little part of my brain permanently dedicated to Christmas food planning, but the planning really starts in earnest about now with the Christmas editions of all the food magazines that I buy. The picture which opens this post is of my December food magazine file. In a way that is very uncharacteristically organised of me, I do keep my food magazines in files according to the month of the year so they can easily be referenced in future years. The Christmas one is full to the brim and I think I need to either get rid of some of the older ones (like the ones from the 90s maybe!) and make room for the new ones, or start another folder! 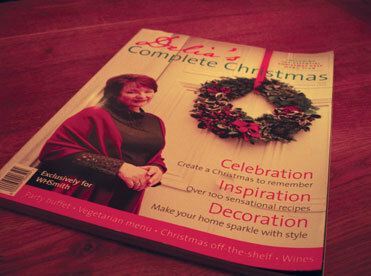 One Christmas magazine that I will never get rid of though is this one. I bought this about 4 years ago, and now I drag it down from the box every year and spend a good hour re reading the wisom of Saint Delia. It is a classic and has some fab recipes in, including one that I have adapted into my own Christmas chutney 9recipe coming soon). I love the way that she says it goes well with 'assertive cheeses'. Everytime I read it I imagine chunks of stilton marching across the table and demanding to be accompanied! I know people think Delia is perhaps a little dull, and certainly some of her programmes would suggest that a charisma bypass has infact been performed, but for simple, no nonsense and traditional recipes that don't fail, she cannot be beaten. Anyway, she has her wild side as can be seen here when after too many sherrys she gloriously abandoned her bland image and came over all firey - come on Delia! When it's cold and wet outside, there is something very cheering about unusual and tropical fruit. I think it was Nigel Slater who said that he can't have Christmas without a pineapple. Anyway, the weather has been really cold here oop north (and elsewhere I imagine!) and yesterday I felt miserable as at no point did my feet ever feel warm which always makes me a bit cross and whingey. But look what we found in Tescos! Instant cheer! Custard apples! 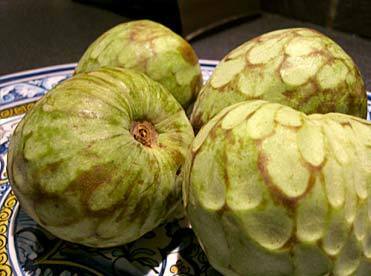 (otherwise known as Cherimoya). I hope that you have had one of these, they are gorgeous. The inside flesh is all custardy and sweet and sticky and as you can see they are very beautiful to look at too. If not, grab yourself one and find out for yourself. We generally find them in asian foodmarkets and the like but supermarkets do get them in sometimes. Like all of the fruit sold in supermarkets, they aren't ripe yet and if you also find one in Tesco, chances are it will be rock hard (or total mush - nothing in between is allowed it seems!). Wait until it yields slightly to a gentle squeeze, rather like you do with an avocado. Actually, the flesh texture is not disimilar to avocado, it has a similar butteriness going on, but is stickier and more silky textured. They have a very slight cheesiness to them too which sounds weird but trust me, is not. I have no recipe for them for the simple fact that I cannot see any better way to serve than with a knife for opening, a spoon for scooping and a bowl for spitting all of the glossy black pips into. The subject of this post is what I say to anyone who asks me what an oyster tastes like. Isn't that true? I have tried really hard but I can't come up with a better description. They taste like the sea! I introduced Mum and Maggie to them recently when I ordered them for lunch when we were all in Edinburgh and they agreed. They do. (BTW we ate in The Ship in Leith which doesn't appear to have a website but is very very good and if you are ever in the area do pop in as the food was really memorable). 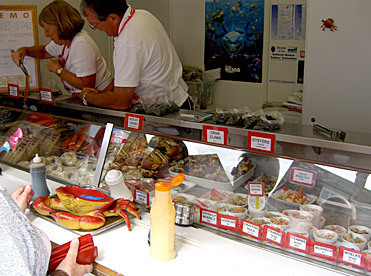 Anyway, this isn't a recipe, just some nice pictures of oysters and my favourite place to get them! 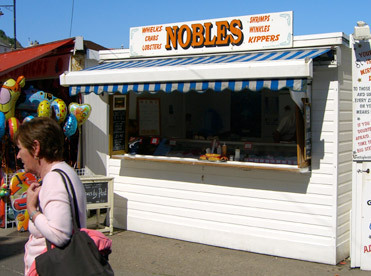 We are going to the cottage this weekend and I will be nipping into Whitby to visit this wee stall. Not that much better but they were busy and whilst happy to be photographed by their greediest customers (we go a lot) we didn't want to interupt their busy trade. 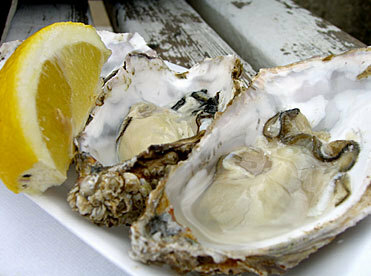 Now it is of course lovely to eat Oysters in slingbacks with a glass of champagne at the ready. But there is something unbeatable about eating them, with a squeeze of lemon, sat on Whitby Pier with the wind in your hair and the sound of seagulls in your ears, watching the boats go by. So if you are ever in Whitby, walk down the harbour on the side opposite the Church and Abbey, past Woolworths, towards the pier. Next to a Gyspy fortune telling caravan with a mysterious scarved lady you will find Nobles and three freshly shucked osyters for £2. I love autumn and everything about it. The colours, smells, that snappiness in the air, the strong sunshine followed by the weaker, watery kind of late afternoon, the mist in the mornings, the return of porridge (more later) ah…was there ever a better season than autumn? 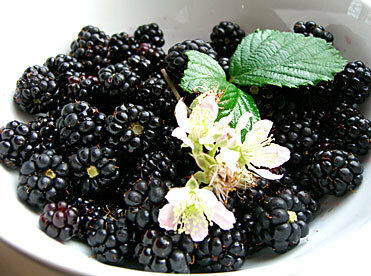 It’s rich and abundant and there is so much that is yummy in the produce of the season. It’s a time for cosy food, eaten by candlelight as the rain lashed down or the fog rolls in. So, what did I make for dinner last night? Well, I am having a love affair with sage right now, it’s the very essence of cold weather cooking for me and I think would be my dessert island herb. I love the robust, aromatic flavour and the way that it stands up to fierce temperatures and even crisps up for a deeper, more mellow flavour. So here we have it. 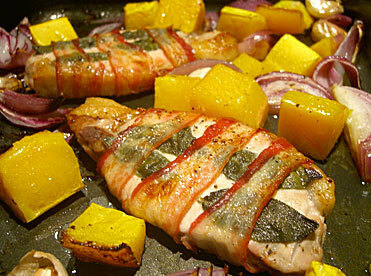 Pork and squash tray roast with pancetta and sage. pre heat the oven to 200 degrees C. Take your pork and put 4 leaves of sage on one side of each. Lay the pancetta over, holding the sage to the meat and then flip over in your hands, add 4 more leaves of sage and wrap the pancetta round. The pancetta gives a rich saltiness to the dish and really perks up the soft pork flavour. Place in a strong roasting tin, crossed pancetta side down. Add the squash, garlic and red onion to the tray, placing around the meat. Drizzle the veg with olive oil and season the whole thing with salt and pepper. Place in the oven for about 40 mins or until the veg is soft and the pork is cooked. It’s nice if you manage to get some crisp edges to your veg but depending on how much juice comes out of the pork and the squash this isn’t always possible and isn’t necessary. Take the vegetables and pork out of the tin, put on a plate and keep warm back in the oven. You should have the juices, the garlic and oil still in the roasting tin. Squash the garlic so the roasted cloves pop out of their skins. Pick the skins out with fingers. Lick fingers. Put the tray over the heat on your stove top. Add the stock and the sherry (about 50mls will do) and simmer. The sauce will become syrupy very quickly. Remove from heat. Arrange the meat and veg on warmed plates and pour over the gravy. 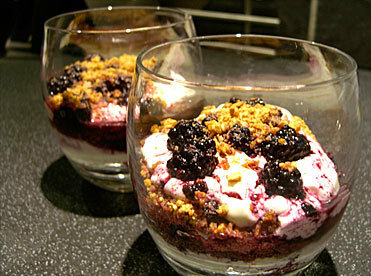 Serve with mulled red cabbage. Eat at the table, by candlelight, with no TV. Have a conversation about autumn flavours and get planning your next meal! What is your favourite autumn meal? dedication: this post is for Carli, who I reckon would have loved this as much as me! Look what was drink of the day in Becketts in Whitby when we were staying at the cottage the other week! A cherryade float! As soon as I read the blackboards there was only one drink for me. It was a lovely sunny day with blue skies and breezes and therefore the perfect occasion to indulge in such a seasidey (is that a word?) and nostalgic drink. I first had an ice cream float courtesy of Emma Sawula when I was about 9 and so she was about 13. It was a Pepsi float and she couldn’t believe that I had never had one before! I had never heard of such a thing but it was amazing and I have never forgotten it. Years later I ordered one for Emma’s daughter Zoe, when she was about seven and she must have said the word ‘delicious’ about 12 times whilst drinking it. 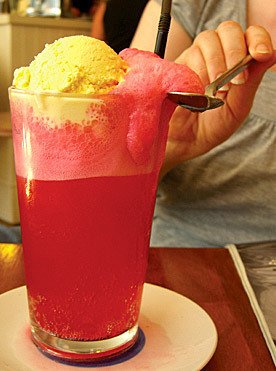 The brilliantest (another made up word) thing about floats is the way the fizzy pop reacts with the ice cream to produce a larva-like foam which overspills the glass. Magic! The best ice cream float is, in my opinion, one made with American cream soda. The combination of the sweet, creamy fizz and the sweet vanilla ice cream is gorgeous. But this cherryade version was absolutely sublime. And so pink! It has to taste good when it looks as good as that. Becketts is a great café in Whitby. As well as amazing homemade cakes and very nice panini it sells second hand books. I found an immaculate, one previous lady owner copy of Tove Jansson’s The Summer Book there, which is a fantastic summer read. And it was just £2.50 to me – bargain! The books are mainly from the lady who owns and runs the café (and more importantly makes the cakes, like rhubarb and custard cake, white chocolate and vanilla, Greek honey, almond and orange…). She’s a big reader and once she’s done with a book she pops it on sale. Great idea! So, if you’ve never had an ice cream float, now’s the time, just before autumn arrives! Grasp one of the last days of summer with both hands, pop a summer dress on and mix yourself a little glass of seaside heaven. Fill a nice tall glass 3/4 full with the fizz of your choice. Now is not the time for sophistication or adult tastes. Think good old coke, dandelion and burdock, Tizer even! Add a scoop of plain vanilla ice cream. No need for a posh kind, good old Cornish vanilla or a similar supermarket soft scoop will do. You MUST have straws otherwise you won’t be able to drink the damn thing. And a spoon. Watch the foam rise and fall over the side of the glass. Sip, slurp, scoop, lick and enjoy. I was given a pasta machine as a gift from my mother. As you can imagine, this, to me, is a very exciting present indeed! Last night Dominic and I decided that we would be brave and chose tortellini as our first foray into the pasta making world. We settled on a stuffing of chestnut and sage with caramelised red onion with a bit of parmesan cheese to bind and also thought if we were going to go to these lengths the least we should do was to make a fresh tomato sauce rather than one made with tinned variety. We made the filling and sauce first so that we could then concentrate fully on the pasta making! It was great fun. We carefully followed the instructions and rolled and folded and floured and eventually had a super thin sheet of pasta almost the length of our kitchen bench! To add to the mood we listened to Puccini and drank martini rosso on ice. Making the tortellini themselves was fiddly and our first 2 attempts were a bit untidy! But by the time we'd made the full amount we were making very professional looking morsels! The sauce was then reheated, plates found and warmed, candles lit and a bottle of Italian red opened and the tortellini were carefully plopped into simmering water for just 3 delicate minutes. Drained, sat proudly on top on the sauce and served. We then sat down to eat. Delicious. But that's not the main point of this post. We were fully in the FLOW of Tortellini, totally absorbed. this, according to the scientists is the real state of happiness and flow is where you are when you are fully in the present, absorbed in something that you are enjoying, finding challenging, creative, relaxing. But most of us only experience flow irregulary, I certainly realised this about myself last night after coming out of the flow of tortellini I thought; "blimey! When was I last that lost in something?" I'd love to hear more about people's experiences of flow, how does it happen for you? What are you doing? When did it last happen? and I suppose, how can we make this amazing state happen for us more often? I promise proper recipes and photos relating to pasta soon...I've got the pasta making bug!